Stand-alone cooktops come in several different styles and can be installed almost anywhere you have counter space. Installing a cooktop and an oven separately, rather than having a full range, provides a wider range of cooktop options to choose from and offers more customization of your kitchen. Choosing the best type of cooktop for your kitchen depends on your cooking habits and the needs of your lifestyle. Maybe your passion for making food demands a versatile cooking space, or maybe you're a messy cook and need a cooktop that is easy to clean. Here is a list of how the common types of cooktops can satisfy the priorities of your household. Of all the electric cooktops, one with electric coils is the most stress-free choice. If you’re a young family on a budget, or if you just need something affordable and tough, these cooktops are the perfect choice. In fact, they are so tough you can scrub and clean the cooktop surface and drip pans as vigorously as you want without worrying about causing harm. Coil cooktops are also beneficial if you use heavy cast iron pans or other heavy cookware that could potentially damage less resilient cooktops. Though they may not be the first choice for home chefs, electric coil cooktops will keep your time in the kitchen simple and easy. People who like keeping their kitchen looking sleek and modern will appreciate the style of a glass cooktop. The smooth surface of the cooktop can sit flush with your countertops and blend seamlessly into your kitchen. Smooth tops are also perfect for people who like a quick and easy cleanup after cooking. There are no cracks or crevices where spilled food can hide. Because the top is made from glass, you will have to take care not to harm the surface with heavy and rough cookware that could leave scratches or cracks. 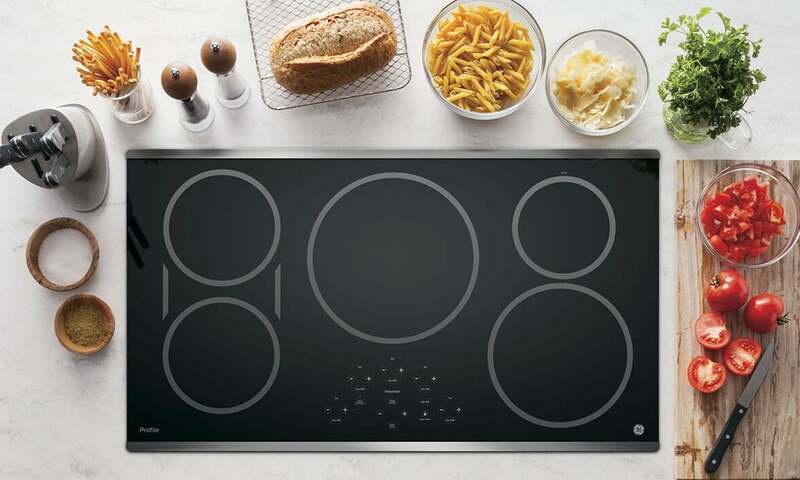 If your household has curious children, pets that wander across your countertops, or an adult who is prone to leaving a burner on after cooking, an induction cooktop should be your first choice. The electromagnetic heating technology of induction burners only creates heat when the burners come in contact with induction cookware or other magnetic metals. There is no open flame, no heated coil, and no hot surface to cool down. If you forget to turn off a burner after cooking, it will be safe to touch almost instantly after you remove the cookware. This technology also helps the burners reach high temperatures in half the time other cooktops take. Superior safety, an easy-to-clean smooth surface, and effective cooking make induction cooktops low maintenance and worry-free. You will have to invest in magnetic cookware if you don’t have any, but you’ll worry less about accidental injuries in the kitchen. Quick temperature changes, even cooking, and compatibility with basically all cookware makes gas cooktops a must for cooking enthusiasts. Imagine a cooktop where you can heat a sauce and immediately reduce it to a simmer on one burner, braise meat in your favorite copper pot, and stir fry vegetables in a round-bottomed wok all at the same time. The versatility of a gas cooktop makes all of this possible. Gas cooktops also cost less to operate than electric cooktops, which could lower the cost of utilities each month, and most can operate without electricity if the power goes out. If you live in a place where the weather causes outages often, you’ll be grateful for your gas cooktop when you can still prepare dinner even though the lights are out. Most stovetops and cooktops are going to be paired with some type of fan or range hood. If you don’t like the look of a range hood and the trouble of installing it, or you just don’t have the room for one in your kitchen, consider getting a downdraft cooktop. The downdraft style integrates a ventilation system directly into the surface of the cooktop. A small vent between your burners works just like a range hood to extract smoke and steam while you cook. This also frees up the area above your cooktop for cabinets, a pot rack, or extra headroom. Both electric and gas cooktops can have a downdraft extractor, but like a range hood or kitchen fan, some ventilation might have to be installed. If none of the other cooktops provide everything you want, it might be time to create the cooktop of your dreams. Modular cooktops let you mix-and-match your favorite cooking elements so you can assemble the perfect cooking area. Individual electric, induction, and gas burners can be pieced together with a variety of other cooking modules for a totally customized cooking space right on your countertop. If you love to grill steaks or hamburgers year round, an indoor grill module will let you avoid the weather outside and grill from the comfort of your kitchen. A deep fryer module allows you to make all your favorite fried dishes with ease while a steamer module provides a healthier option to cook with. You can even integrate downdraft ventilation. If you’re looking for a complete range with your cooktop, head over to our Complete Kitchen Range Buying Guide for lots of helpful tips on what to look for.